This is the second in a series of game guides I’ll be writing for Crew Skills, discussing various systems of game mechanics to help everyone get up to speed nice and fast. If you have any questions, please feel free to ask! Please note that this post has been prepared based on my experiences in the beta, and relies on information from the various SWTOR beta tests. Some parts of the game system have changed within the last few weeks, and may still change before launch, so please bear that in mind. I’ll keep the post updated as much as possible. SWTOR gear is usually BoE or BoP, as is common in many MMOs. Niftily, you can equip bound items to your companions as well as your own character – so if you have a great gun but get an upgrade, you may well have a companion who can make use of it. All player characters have 14 equipment slots: nine for armor, two for weapons and three for relics. Companion characters can wear the same gear you do, but they don’t have any relic slots. Note that companions have their own gear restrictions based on their ‘class’; even if you’re a heavy armor user, your companions might use medium or light armor. Update: This diagram is no longer correct! There’s now two relic slots, and two implant slots. Armor comes in three types: heavy, medium and light. Heavy armor is worn by Jedi Guardians, Sith Juggernauts, and all Troopers & Bounty Hunters. It’s itemised for Strength for the Force-users, or Aim for the Troopers & Bounty Hunters. Medium armor is worn by Jedi Sentinels, Sith Marauders, and all Smugglers & Imperial Agents. It’s itemised for Cunning for the Smugglers & IAs, and Strength for the Sentinels & Marauders. Light armor is worn by all Jedi Consulars & Sith Inquisitors. It’s itemised for Willpower for everybody. There are a range of weapons available (blaster pistols & rifles, assault cannons, flamethrowers, a range of vibroblades, and of course lightsabers; some can be dual-wielded by some classes. Each advanced class basically has a signature weapon and can use very few weapons other than their signature weapon. Also, note that holding a two-handed weapon doesn’t stop you equipping something in your off-hand. Other melee weapons include vibroknives, vibroswords, and electrostaves. Vibroknives are available for both advanced classes of Imperial Agent (in their off-hands); vibroswords and electrostaves are used by Force-users (if for some strange reason they’re not using their lightsaber). There are also training sabers, which are a separate category of item, but many are named like vibroswords. Blaster pistols are used by all low-levels Bounty Hunters, Smugglers and Imperial Agents, and then BHs who choose the Mercenary advanced class dual-wield them, as do Smuggler Gunslingers. Smuggler Scoundrels and IA Operatives use a single blaster pistol. Blaster rifles are used by all troopers at low levels; Trooper Vanguards continue to use them for their entire careers. Other ranged weapons include Sniper Rifles (used by the IA Sniper), Assault Cannons (used by the Trooper Commando), Flamethrowers (used by Bounty Hunter Powertechs), and Scatterguns (used by Smuggler Scoundrels). 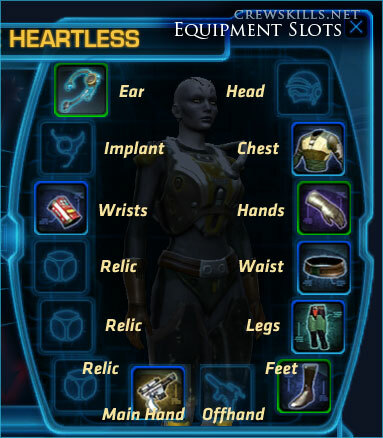 Off-hand items may include weapons (blaster pistols, lightsabers and vibroknives), shields (as in ‘technological force-field bubble’, not ‘a handle bolted to a metal plate’), foci (Force-user off-hand items) and generators (which seem to be stat amplifiers for other non-dual-wielding classes). These were not fully implemented in game when I was testing it, and I’m not sure what relics are or do. The only relics I know of at the moment are hard to get and have relatively small base stats bonuses on them. I suspect (although I’m not sure) that this is something BioWare has been keeping under wraps until launch. Equippable items generally carry multiple bonuses that will boost the stats of anybody who wears them. All equipment is itemised for the classes who use that equipment: you won’t find lightsabers with non-Force-user stats on them, for instance. Armor and weapons all have one stat of their own, as well: Item Rating. This is basically a measure of the item’s overall level; WoW players will recognise it as the same sort of concept as ilvl. All other things being equal, a Rating 20 item will have more/bigger stat bonuses on it than a Rating 10 item. Items also have a ‘quality’ level, which denotes how common the items are; all other things being equal, a higher quality item will have more/bigger stat bonuses on it than a lower quality item. The quality scale in SWTOR goes from ‘cheap’ to ‘legendary’, which is quite a scale! I originally referenced the quality scale in my first examination of the crafting system in early October (pre-beta-access, as you can tell from the wild speculation!). Each quality level has a colour associated with it, which will be familiar to players from other MMOs. Items of premium quality or better have a coloured border around their icons to allow you to see their quality at a glance, which is incredibly handy. Prototype: blue. Rarer gear from “better” crafting, special quest rewards, looted from special enemies and flashpoint bosses, etc. Artifact: purple. Very special gear that’s very hard to get, from high-level content, special crafting, very occasional lower-level flashpoint drops, etc. There are also gold-bordered items that are statless moddable gear; see my upcoming mods post for more details! I’d like to particularly thank my friend Maxi for his assistance in preparing this post; he played in the same beta weekend I did, and provided a lot of info for some of the classes I never got a chance to try. Yeah, I’ll go into more detail in the mods post. As far as I know, though, orange/gold still means “no innate stats, but with all mod slots open”, right? Like the social gear, etc? Whereas purple/blue gear has mod slots, but also stats. Well haven’t come across any orange in this build so I wonder if they have phased these out. Havent got as high as before but i think i got my first on when i left my origin planet. Imperial Agents now start with a blaster rifle, not a blaster pistol. Operatives stay with the rifle, and snipers switch to sniper rifle. Cool, thankyou for the info! I mistakenly reversed engineered my focus generator, I am lv12 Sith Juggernaut and need another one! Where is the nearest location to getting another or can I craft one?